The Federal Bank Limited is a major private sector commercial bank.Federal Bank has 1252 branches spread across 24 states and 1516 ATMs across the country. Federal Bank hire both freshers and experienced candidates in every year. All job seekers who are interested to get a job in Banking Sector can apply this job online. The Candidates from 2017,2016,2015 Batch who have completed BE / BTech, Graduate, Engineering Degree from any recognized Institute are Eligible to this Recruitment 2017-18. 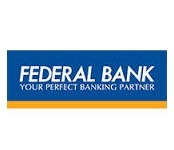 Federal Bank recruits in various positions like Junior Officer,Federal Bank Probationary Officer,assistant investment managers,Depository Participants Relationship Manager,Finance Officer,Economist Security Officer,Senior Risk Officer,Chief Investment Officer,Technical Officer,Credit Risk Management Officer,Sales Officer etc. i) Clerk – Candidates shall not exceed 24 years as on 01.06.2017 (candidates should be born on or after 01.06.1993) for being eligible for the post of Clerk. ii) Officer – Candidates shall not exceed 26 years as on 01.06.2017 (candidates should be born on or after 01.06.1991) for being eligible for the post of Officer. (i) Keep the particulars of educational qualifications and other personal details ready before applying as these details are required to fill in the online application form. (ii) Keep scanned copies of their latest passport size photograph and signature ready for uploading while submitting the online application. Candidates shall comply with the specifications cited in the online application, with regard to the pixel resolution and size of the scanned images used. during currency of the recruitment process. (iv)Call letter can be downloaded from the Bank’s website prior to the date of online aptitude test. Bank may send communications with regard to the selection process & final interview to the registered e-mail ID / mobile number. In case, a candidate does not have a valid personal e-mail ID / own mobile number, he/ she should create his/ her e-mail ID and mobile number before applying online. (v) To submit applications online, log on to Bank’s website www.federalbank.co.in, follow the link „Careers‟, and click “Apply Online” under „Recruitment process for the post of Clerks / Officers‟ provided in the ‘Careers’ page. Read the eligibility criteria and ensure the instructions carefully, and fill in the relevant details as sought in the online application form. After filling up all details required in the application and uploading photograph & signature, click ‘Submit‟ available at the bottom of the online application for proceeding to the online payment gateway. Candidates shall make thenecessary payments as applicable to register their applications for the post of Clerks or Officer.In case of any failure in payment process, candidates are advised not to repeat the process of payment immediately. Instead a mail shall be sent to [email protected] and only in case of a confirmation from the Bank’s side, shall a subsequent payment be made.